There's a game coming out in a couple of weeks called God of War. It's a game that for the first time is making the switch from a game about Greek mythology to Norse mythology. 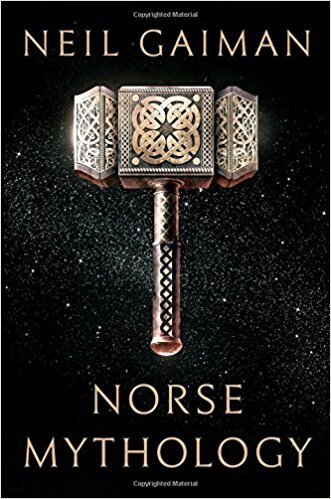 After reading Stardust, a novel I enjoyed quite a bit I thought a great prepper for God of War would be the latest book from Neil Gaiman, Norse Mythology. Think of Norse Mythology as Gaiman's own interpretation of several old famous Norse stories. The majority of the stories will be about Thor, Loki, and Odin with appearances from Balder, Frey, and Freya. There's isn't really a sequence of the stories per say but they seem somewhat chronological and really that only matters at the end of Norse Mythology with Ragnarok. Going in I didn't know any of the Norse stories. I knew of Thor, Loki, and Odin because of the Marvel movies but those have such light touches on those stories that these were basically brand new. One of my favorite stories in Norse Mythology was how Thor got his hammer which was light and fun and full of whimsy. Some of the stories in the middle of Norse Mythology didn't land as well. I think if you're like me and you don't have a pre-existing knowledge of these stories, these tellings might not give enough backstory for you to follow everything. And that's sort of where I landed with Norse Mythology. There were a handful of stories I really liked and the rest I was really middle of the road on. I think it was a great prep for God of War but I'm not overly convinced it was a great book of short stories.